Wild Tusker Lodge is located in the heart of the Corbett, in the tiny hamlet of Bhaikrakot where the lodge is situated. Wild Tusker Lodge is unlike the numerous resorts which dot the eastern boundary of the park. 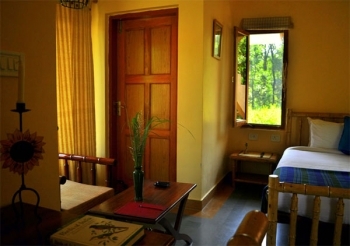 Rather, it is a deluxe jungle lodge similar to the daak-bungalows of the British era. The lodge is dedicated to conservation and the protection of our country rich natural heritage. The Wildtusker Lodge promises an exclusive wilderness and a relaxing experience of being amidst nature in all its pristine glory. Those who value the experience of exploring nature and unwinding in such settings will undoubtedly appreciate joys of this place. The numerous walking trails near the Lodge, make it unique place. Short walks from here take you dawn to picturesque streams, which are important sources of water in summers for all wild animals. On these trails, tigers, leopards and wild elephant are regularly sighted. A visit to the Wild Tusker Lodge would provide an excellent opportunity to wildlife lovers and adventurers to romance the wondrous world of Jim Corbett. We invite you to witness the pristine beauty of Corbett with us. 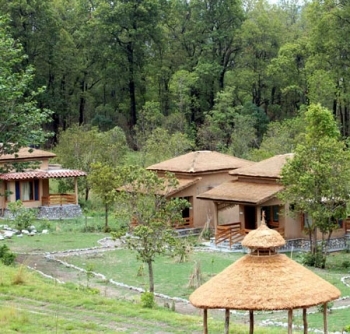 Resort Wild Tusker Lodge is located in Village Bhakrakot, is 26 km from Ramnagar city of Uttarakhand state. The village is near the hamlet Mohan. Which is on the national highway-121 that leads to Buakhal through Ramnagar. After the left turn towards Buakhal, from Mohan, the first right turn on the highway (approx. 1.5 km), leads you to the village through a dirt road on a steep incline. This dirt road is preferably to be motored only in a 4x4 vehicle. So, it is advised that these last 400 m to the lodge should be climbed on foot or in a 4x4 vehicle which can be made available to the guests. Adequate arrangements will be made, to park guest vehicles and for porters to carry luggage. Ramnagar city is located 274 km from the capital New Delhi, 180 km from the holy city of Haridwar and 62 km from the hill town of Nainital. The lodge offers 6 (two rooms) comfortable, elegantly furnished rooms. The rooms have been built to provide a clear view of surrounding landscapes, with minimum disturbance. The property itself has generous open spaces and greenery due to which cheetal, sambher, friendly tuskers and wild-boar often frequent the area. You may even sight theses animals while sitting in the verandah of your cottage or the restaurant. There is a well laid out multi-cuisine 'Chowgarh' restaurant, where you can enjoy meals in Corbett Wild Tusker Lodge. - Hot water provided eco -friendly solar geysers. -A library-lounge with special emphasis on wildlife and nature books. -Relax around a bonfire and have surreal experience, enjoying the forests under the crystal clear night sky. - Half day trips inside the National Park. Stays in the park at the old forest rest houses of Kanda and Lohachaur. -Get insight about the region from trained naturalists. -A trek and drive to the Ramnagar river near Marchula, for mahasher angling. -The forests around the Bhakrakot region is a bird-watchers paradise. Indulge in one thrilling bird-watching. -Explore good collection of books and wildlife magazines at the library. -Relax and catch up on outdoor and indoor games. - Half day jeep-safari inside the Park to Bijrani/Jhirna/Durgadevi will be charged Rs. 900 (per person). Drive from Delhi via Moradabad, Kashipur and Ramnagar: 6 hours (274km). Drive from Lucknow via Bareilly and Moradabad to Ramnagar - 8 hours( 400 km). Drive from Dehradun via Rishikesh and Haridwar to Ramnagar - 5 hours (227 km). Take an overnight air-conditioned train from Old Delhi railway station (departing at 2245 hrs) to Ramnagar (arriving at 0500 hrs). The Nearest international airport is at New-Delhi. And the nearest domestic airport is at Pantnagar- 1 hour drive (70 km).